Instrument consisting of a parabolic copper basin covered with a stretched membrane that is struck with mallets. 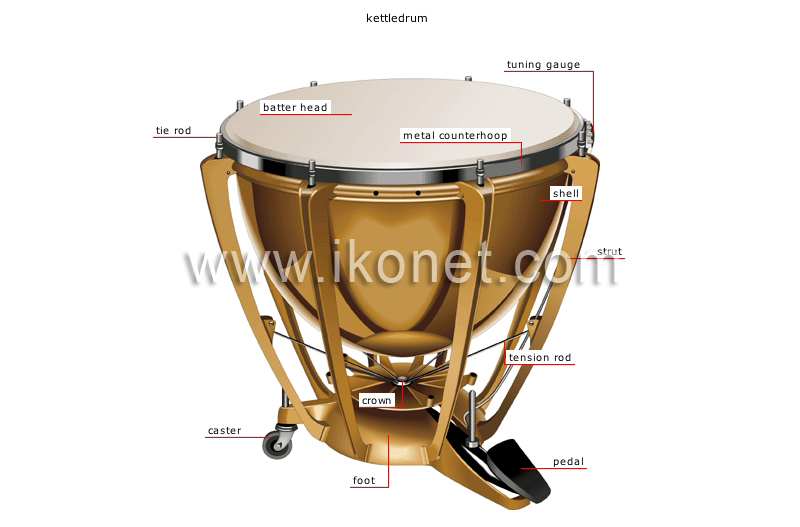 The base of the kettledrum. Device connected to the crown that adjusts the tension of the membrane to change the tuning of the instrument. Plate raised and lowered with the pedal to adjust the position of the tie rods. Metal rod connecting the crown to the tie rods. Metal frame with several branches; it supports the shell. Parabolic copper basin that functions as a sound box. Part used to adjust the pitch of a note and obtain precise tuning of the instrument. Metal part connected to the tension rod; by adjusting the tension of the batter head, it changes the drum’s pitch. Membrane that is struck with a mallet. Metal hoop that stretches the membrane over the shell to control the tone of the instrument.